In other words, the empirical CDF of converges uniformly to the true CDF. My mathematical statistics professor at the University of Toronto, Keith Knight, told my class that this is often referred to as “The First Theorem of Statistics” or the “The Fundamental Theorem of Statistics”. I think that this is a rather subjective title – the central limit theorem is likely more useful and important – but Page 261 of John Taylor’s An introduction to measure and probability (Springer, 1997) recognizes this attribution to the Glivenko-Cantelli theorem, too. Continuing from the previous posts in this series on EDA, I will use the “Ozone” data from the built-in “airquality” data set in R. Recall that this data set has missing values, and, just as before, this problem needs to be addressed when constructing plots of the empirical CDFs. Recall the plot of the empirical CDF of random standard normal numbers in my earlier post on the conceptual foundations of empirical CDFs. That plot will be compared to the plots of the empirical CDFs of the ozone data to check if they came from a normal distribution. 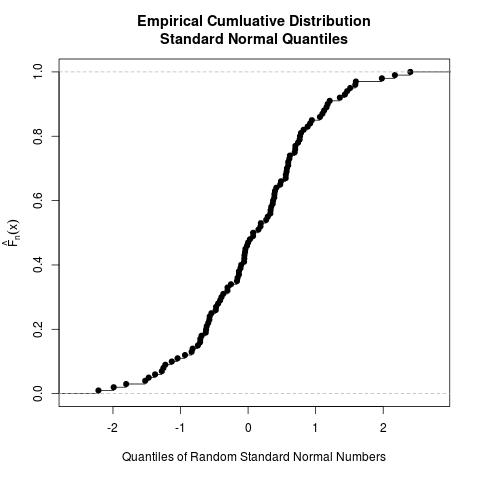 To give you a sense of what an empirical CDF looks like, here is an example created from 100 randomly generated numbers from the standard normal distribution. The ecdf() function in R was used to generate this plot; the entire code is provided at the end of this post, but read my next post for more detail on how to generate plots of empirical CDFs in R.
Read to rest of this post to learn what an empirical CDF is and how to produce the above plot!